Just wanted to let you know your staff was amazing. I had forgotten to order mats, so ended up ordering them on Wednesday evening, before the show and after my horse had already gotten to Glen Rose. Thursday, mats were delivered! Incredibly fast service. THANK YOU!! 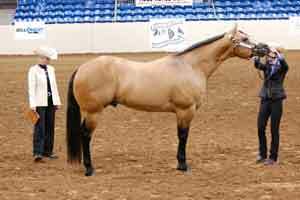 I used them in Fort Worth last year at an arabian show and they were fabulous!! It was so nice to have them in the stalls ready to go when we got there! My horse was comfortable all week long and as soon as we left we just let them know that we were gone and they picked them up! Great customer service and easy to work with at the show. No hassle! Absolutely love your company!! I've used you guys for the BBR Finals and the ShootOut in OKC for the past couple years!! No hassle easy to rent and I love knowing my stall ready when I get there!! Great company!! Thank you!! I'll be in OKC for the BBR Finals next week!! 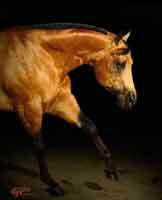 Looking forward to your help with my stall at Paint Horse congress this year. Used you for the first time a couple years ago in Tulsa and had such a great experience. Mats were in my stall when I got there and another person wanted mats in their stalls that were with us after they saw mine, called and someone was there putting mats in their stalls within 20 minutes. Great Service! We recently rented stall mats from you at AQHA Youth World in OKC. The mats were very helpful and your service was excellent. Therefore, I would like to rent a mat for my horse for Select World in Amarillo. Thank you we always enjoy renting from you. You have outstanding customer service. Thank you so much Elite Stall Mat Rentals! Our horses were wonderfully matted and we loved having the aisle way done... looked sharp and was easy on our joints as well. Everyone commented! LOVE THEM. The mats were wonderful and put my mind at ease leaving my horses in the stall. 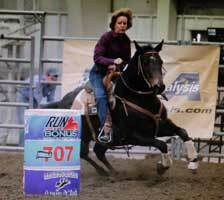 I typically do not stall my horses so events like that are not ordinary for them! Knowing the mats were easy on their legs was really nice. Thanks so much for offering your services to the bonus race finals, I hope you return next year! Thank you and Pam and all involved for supplying the stall mats at the Bonus Race Finals, in Lincoln, NE April 10-13. I am so glad you were there!! A huge thanks to Elite stall mat rentals for making it so easy to travel with our horse. When we travel our horse, Gunner has a tendancy to be nervous the first couple days. Our first time we used your mats it was wonderful the mats were set up and ready to go when we arrived and we didn't have to worry about anything. Gunner was comfortable and rested when it came time for him to perform with our daughter, Marlie. We will definitly us them again and again when we travel. Thank you so much for your wonderful service. Renting stall mats from Elite Mats was one of the best decisions I made during the Pinto World Show. They were responsive, set up my stalls when I arrived and I didn't have to do anything upon departure! Easy and well worth the fee for the comfort of my horse on cement floors for two weeks. I highly recommend you contact Elite Mats for your next show needs. I plan to. I love using Elite Stall Mat Rentals. It is so convenient and gives me the peace of mind of having one less thing to haul and unload at the shows. As a trainer I know my horses will be comfortable and their legs can rest being on mats instead of concrete. It's also a peace of mind on the safety side of things. I don't worry about slipping or rubs. We use them at every show they are available! Thank you so much for helping us with the Turn for Twister Benefit. We cleared just under $29,000!! God certainly blessed this event and showered us with His grace. We started with nothing except a vision, a will and God's mercy. Thank you for making it possible!! 100% of the proceeds will be used for the victums in need. Again, we greatly appreciate your genorosity!" Thank you so much for providing mats for my stallion's stall at the 2012 PtHA World Show! KH Money Man was able to lie down and sleep on his side and this let's me know that he was extremely comfortable and well bedded down on those concrete floors. Also, thank you for going above and beyond by helping me with moving stalls. I can never thank you enough for helping me. I highly recommend you to anyone who wants the best for their show horses and the best customer service! If I could give you a grade higher than A+, you would get it! I cannot wait to meet up with you again! KH Money Man (aka: Dusty) & Tiffany M.
Thank you for the mat, I really feel it was well worth the money. My horse isn’t used to staying in a stall and usually has slight swelling after being kept stalled over a weekend, but not this year. With the mat and shavings I could tell he felt fine and had no swelling. I will definetely be a repeat customer! 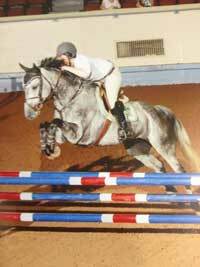 "I could really tell a difference in my horses performance the last two years I used your mats. 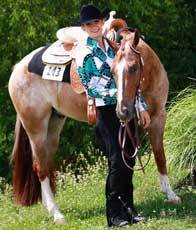 I Just wanted to let you know that I loved having the comfort of the Stall Mat for my aged gelding during the 2 weeks of The Appaloosa World Show. He did wonderful and it is so easy to keep his stall clean. Thank You Stall Mat. I will do it again next year. You don't know how much I appreciate you refunding part of my stall mat rental! What a respectable gesture that I was not even expecting! Recouping any little bit will help with the thousands we lost with the Redbud cancellation (due to the OK tornados) but we are so relieved to have escaped without injury. 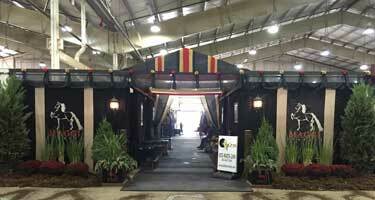 We use your stall mats and Just Setups at the Grand National Morgan World Championship Horse Show. It was a service that made great sense to me and wish it was available at every show we attend. It was especially great for the Morgan Worlds because of the long distance our horses have to travel! I have learned that they will do it right, with our stalls disinfected and checked for safety as well as bedded just like I asked! What a relief for me, my help and most importantly my horses. The stall mats are a home run, our horses never have to stand on concrete floors and it also cut our shavings cost! Our animals are too valuable to take short cuts! The stall prep/mat package is a must! Every owner should get it for their horse's safety and comfort! Thank you!!! Pro Plus is great service, especially when we drive 18-20 hours!!" Thank you again for providing the mats for the photo backdrop area. They were perfect. Look forward to working with you in the fall. Thank you for the use of the stall mats in Perry at the NBHA Worlds. I believe they were beneficial to my horse's performance the entire week. I just LOVE LOVE your service!!! !